Earlier this year Birmingham Friends of the Earth launched a very ambitious Community Share Offer in order to renovate our home, an old Victorian building in Digbeth. The building is a beautiful piece of architecture, but is in need of repair and work needs to be done to transform it into a building fit for BFOE in the 21st Century. The management committee, the campaigners and everybody else involved with BFOE worked incredibly hard on putting together and promoting the Share Offer. We had a daunting core target of £240,000, which would allow us to renovate the building. As part of the Share Offer, we want to put in a lift, to allow those with access needs to have full access to the building. We want to continue to make the building more energy efficient. We want to create more meeting room space and give our tenants space which better reflects their needs. We put in a lot of effort over two months to promote our Community Share Offer. On the final day, with the help of match funding from Co-ops UK, a large investment from Friends of the Earth England Wales and Northern Ireland; and 88 investors, we successfully raised £240,000. The Community Share Offer closed at the end of June. Since June we have been planning the exact details as to how we are going to implement the renovation plans. Architectural drawings have been drawn and then redrawn by our resident architect, Ben Mabbett. Tenants have been liaised and negotiated with. Board member, Richard Bickle has been overseeing the project, and we have hired a new Finance Administrator; Nasreen. Jericho are the building contractors who have been tasked with carryout the works. On the 2nd of October Jericho started the enabling works on the building, and now the Warehouse is a hive of building activity. 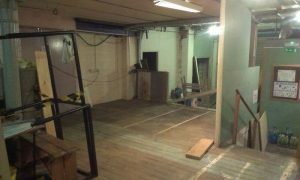 Jericho have started to take up the floor in Middle Bay, they’ve knocked the wall down in the lift shaft and concrete has been set in the new entry way. Jericho are being very careful to recycle all materials where possible. The bricks that Jericho have taken away will be used elsewhere. Over the coming moves the building work will intensify and the building will be transformed. There will be some disruption, Monday night meetings may take place temporarily away from the Warehouse. 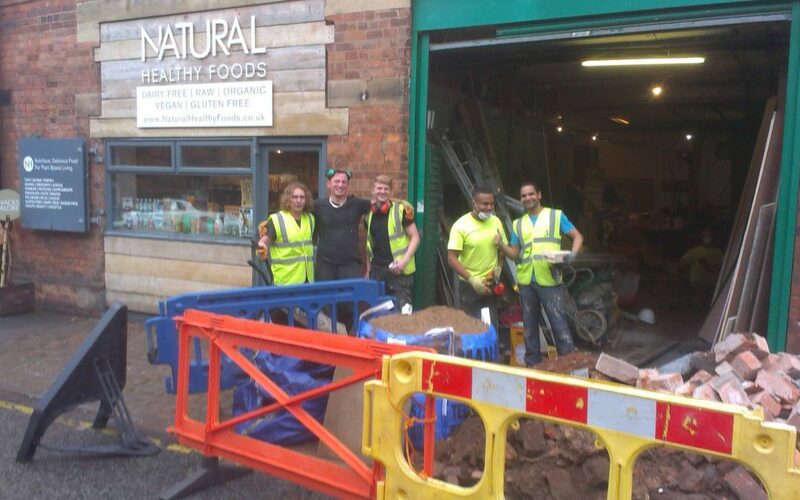 Once the building work is completed we are confident that the Warehouse will be a great home for us, that will allow us to fully achieve our potential in being the green heart of the city.